All the updates on Thursday from Jakarta and Palembang. India stunned by Malaysis in the men’s hockey semi-final. Details in our hockey live blog here. 10:00 pm: That’s a wrap for the night! Athletes made the day exciting for India once again as draw ever closer to the end of the Asiad. Thanks for joining us. We’ll leave you with Friday’s schedule. Familiar opponents for Sharath and Sathiyan in the R16. India’s defeat to Malaysia in the semi-finals will certainly be one of the biggest talking points from the Games when the dust settles. Here’s what the High Performance Director had to say about it. With only two medals assured, does Indian boxing need a reboot? An analysis of India’s boxing performance at the Asiad. 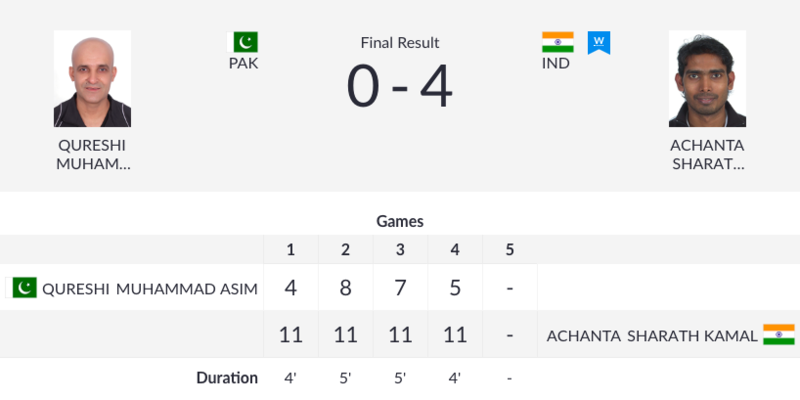 India men’s team also lose their final group game. They go down 1-2 against Malaysia (with only Saurav Ghosal winning his match) and will now face top seeds Hong Kong in the semi-final. Not the best of days for India - men’s and women’s teams - as they lose their final group games to put themselves in a tricky position of facing the respective top seeds in the semi-finals. Sathiyan, frustrated for long periods in the Round of 16 match, progresses to the quarter-final. Needed 6 games to beat world World No 942 Santoso but a win is a win. Sathiyan joins Sharath and Manika Batra in the last 16. Harendra Singh says it’s unpardonable that India lost. “Malaysia are the deserving winners. We committed too many unforced errors and paid the price. We did not keep things simple. We tried to show our Indian skills and by doing that we lost the momentum. It is a big setback for Indian hockey. The road to Olympics is a lot bumpier now. We missed the easiest chance to qualify,” said Harendra. It was only Malaysia, who had stunned India in the semi-finals of the 2010 Asian Games in Guangzhou. It’s been a very up and down performance by Sathiyan and ends up dropping the 5th game 9-11! He’s not a happy man, visibly frustrated with himself. Starts the 6th game well, with a 5-2 lead. Can’t believe this. India bt Japan 8-0 and Pak bt Malaysia 4-1 in the pool phase. 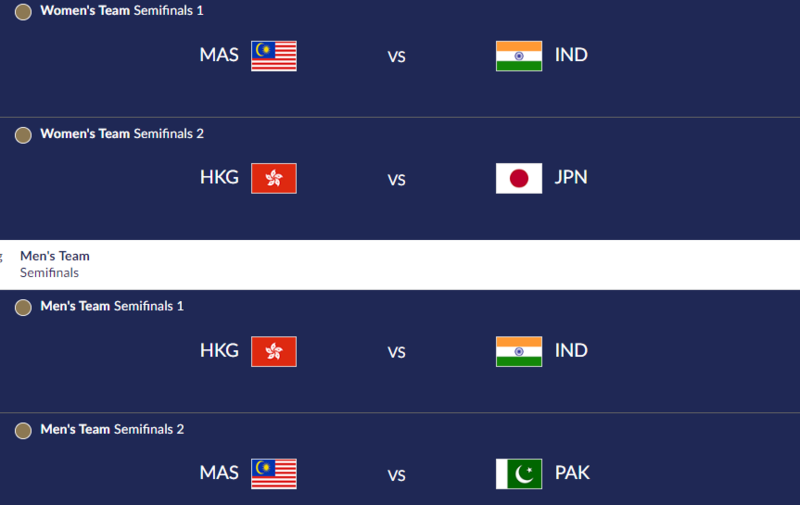 And now Malaysia and Japan will contest the mens hockey final and Ind vs Pak for bronze. N I thought I had seen it all @asiangames2018. A nice self-motivational post from PV Sindhu. Sathiyan, error-prone once again, almost lets the 3rd game slip too but holds on to his nerve and takes it 14-12 to establish a 2-1 lead. The next game is over even before we could finish writing up our last update as he wins it 11-1 and move to within one game for a place in the round of 16. Tajinder Pal Singh Toor was dominant in the Shot Put final, setting a new national and Games record of 20.75 metres. He won India’s 1st Athletics gold medal in Indonesia. The flag-bearer lived up to his billing and then some. Miles ahead of the rest, Neeraj Chopra set a new national record with a throw of 88.06 metres. The 20-year-old was just too good for the rest of Asia. Manjit Singh ran the race of his life. He wanted to quit the sport 2 years ago, but held back and piled on the speed in the final 80. The 28-year-old was the unlikeliest 800 meter gold medalist, having finished 8th overall in qualification. Arpinder Singh ended a 48-year-long wait for an Indian triple jump gold. 16.77 meters was enough as Arpinder triumphed in Jakarta, emulating 5-time NCAA Champion Mohinder Singh Gill. Swapna Barman created history, winning India’s 1st-ever Heptathlon gold. The 21-year-old set 3 personal bests over 7 gruelling events, while suffering from a septic infection in her tooth and immense pain. The women’s 4x400m relay team ran a brilliant race to win the Asiad gold for the FIFTH consecutive time. Against highly-fancied Bahrain, Hima Das went 1st, taking a 25m lead. That allowed VK Vismaya to start roughly 30-40 m ahead of Naser - the star of the field who ran a blistering 49.08 in Monaco in 2018. Even for her, the gap was too large and India celebrate the gold. Jinson Johnson’s annus mirabilis continued. 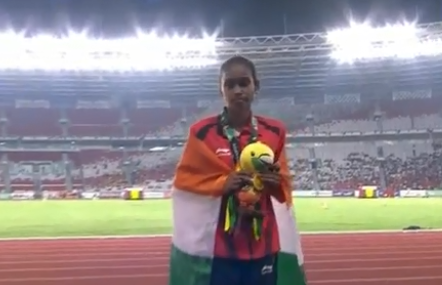 The Kerala athlete set two national records in 2018, and won a 1500 metre gold to add to a 800 metre silver at the Asiad. A bit of a blip for Sathiyan after the breezy first game, he drops the 2nd game 9-11. Surely just a blip though? Let’s see how he bounces back. Sathiyan breezes through the first game, takes it 11-4. 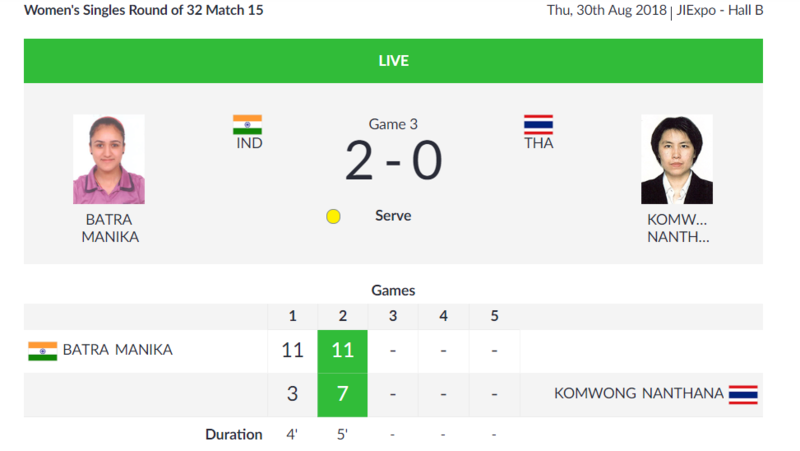 Manika Batra is through to the round of 16 with a facile 4-0 win against her Thai opponent. India’s Athletics contingent can be proud of their efforts. They have contributed 7 of India’s 13 golds at these Games and 19 of their total 59 medals. Alright, athletics is now done! What a performance by the AFI contingent. We’ll do a quick recap in a bit. For now, Manika Batra is in action in the women’s singles round of 32 and she has taken a 2-0 lead. 7.22 pm: SILVER MEDAL ALERT! Anas with a superb third leg gives Arokia enough room at the end to finish second behind *Qatar. Arokia holds off the challenge from Japan and Sri Lanka. Japan win bronze. Qatar*, meanwhile, set a new “Asian” record. Bahrain leading from the start but Anas and Arokia are keeping India in the hunt for silver. Kunhu-Dharun-Anas-Arokia is the order for India. 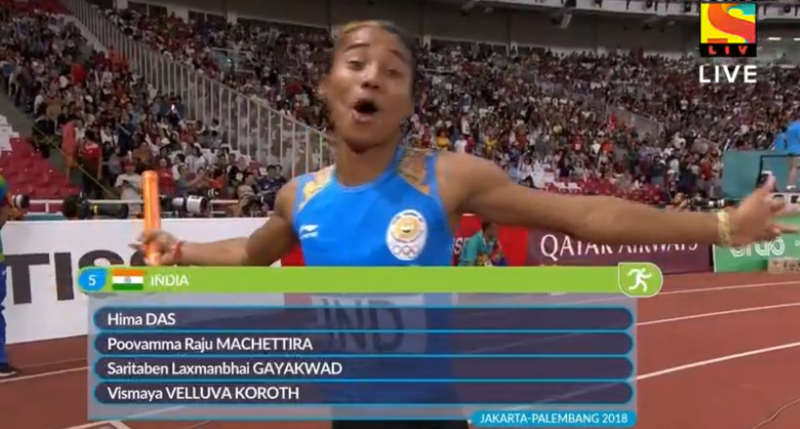 STAT ALERT, by Abhijeet Kulkarni: This is India’s second best Athletics performance in the Asian Games. India had won 10 gold in 1951 and the second best so far was 2002 Busan Games in which India won 7 gold and 6 silver. 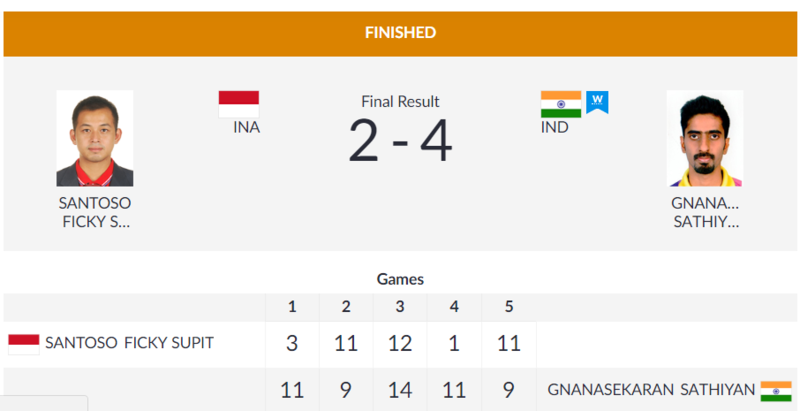 In Jakarta, India has already won 7 gold and 9 silver to go with two 2 bronze medals. Can the men’s relay team add to it. Looks like there is a delay to start things off. There is a medal ceremony for Jinson Johnson winning GOLD! After yesterday’s qualification saw Arokia and Anas give it a miss, India are back to full strength for a final. It could well be another India v Bahrain battle. Here we go.... moments away! For PU Chitra, this will be a sweet medal considering all the controversy over her participation at the World Championships. Details on that here. 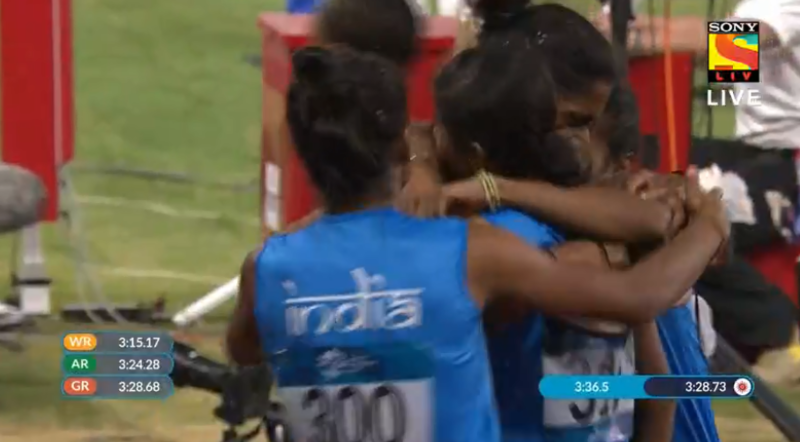 6.55 pm : GOLD MEDAL FOR INDIA! In one of India’s favourite events at the Asian Games, the women deliver again! India are in some lead here! Next up, women’s 4x400m relay FINAL and it’s time for Hima Das & Co again. Here’s the lineup, Hima Das goes first. A look at the timings of the 5000m final. Look at the difference between the top two and the rest. Govindan Lakshmanan was out of medal contention, 3/4ths of the race. The Bahrain runners finish comfortably ahead of the pack as expected. Confirmation coming in soon. 3. TWO Bronze medals, discus & 1500m #AsianGames, amirite?! Right, time for Lakshmanan again. After the heartbreak in 10000m can he get another medal (and keep it) in the 5000m? Time to just take a stock at what we witnessed in the men’s hockey. Here’s how the men’s team has performed at the Asiad over the years. Surprisingly enough, just two gold medals. The Indian athletes continue to delight... Silver in the 800, gold in the 1500, national record holder in both: one can’t help but be happy for Jinson Johnson, who was the favourite for the 800m gold but ended up being surprised by Manjit Singh’s late burst. The latter tried to repeat that here in the 1500m but it came too late and he finished fourth. 6.11 pm: GOLD MEDAL ALERT!! 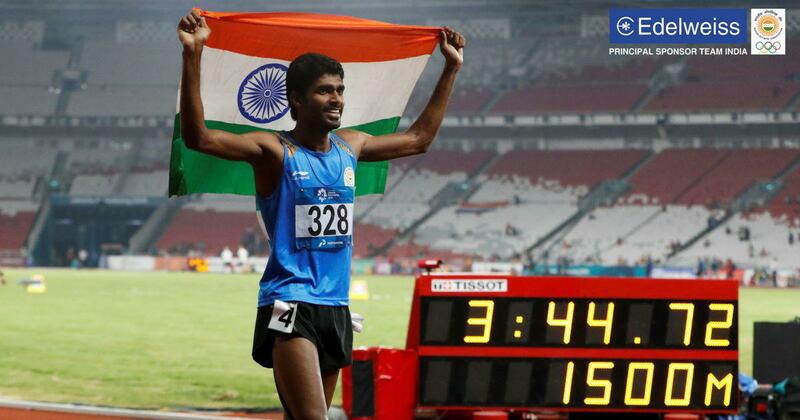 Jinson Johsnon does it in the 1500m final.... India have their 6th GOLD MEDAL from athletics. Right, moving ahead. Manjit Singh and Jinson Johnson are medal hopefuls and are in action right now. While the men’s hockey team went down to Malaysia, the athletes continue to shine. 6.02 pm: HOCKEY - INDIA ARE DEFEATED! SV Sunil of all people misses in sudden death and the defending champions of Incheon have been defeated in the semifinals.... that’s a shocker! Hockey live blog here, if you want the details. Sudden death? More like slow death... this is going on and on. 5.58 pm: BRONZE MEDAL ALERT! TWO BRONZE MEDALS IN QUICK SUCCESSION FOR INDIA! And it’s PU Chitra in the Women’s 1500m final. 5.55 pm: BRONZE MEDAL ALERT! It’s sudden death after shootout ends 2-2! After the first 5 attempts of all athletes, Seema stays third despite a foul. Bin Feng doesn’t improve her attempt too so there’s a still chance. Yang pulls ahead. Sandeep Kumari fouls again as well. India are trailing in the shootout! Oh dear, oh dear. After the first 4 attempts of all athletes, Seema stays third. Her 4th attempt was not her best while Bin Feng pulls ahead in 2nd position. Incidentally, Seema’s 2nd attempt is her Season Best. 5.40 pm: HOCKEY – DRAMA!! Oh dear! Not good news for India from the hockey game... Malaysia equalise in the dying seconds and we are headed for a shootout. India have been poor in the final quarter, but Malaysia deserve this. This is anybody’s game and India are in danger of exiting before the final. Follow the match in our hockey live blog here. After the first 3 attempts of all athletes, Seema is third, just *0.08m off Bin Feng in the 2nd place. Sandeep Kumari is fifth. Seema is delighted with her third attempt. Lets out a cry of delight, with a combination of anger and relief on her face. And she should be happy, it’s a SEASON BEST for her: 62.26m, just 0.12 off the second placed Bin Feng. Wow. Both of China’s athletes have now zoomed past the rest of the field. Yang Chen with a 64.45m in her second attempt, Bin Feng with a 62.34 m in her third. Setting the standards here early on. Both Kumari and Punia have fouled with her second attempts. Punia’s first attempt keeps her in the *third place for now. China’s Bin Feng has just laid down the marker with a 61.84 in her second attempt. 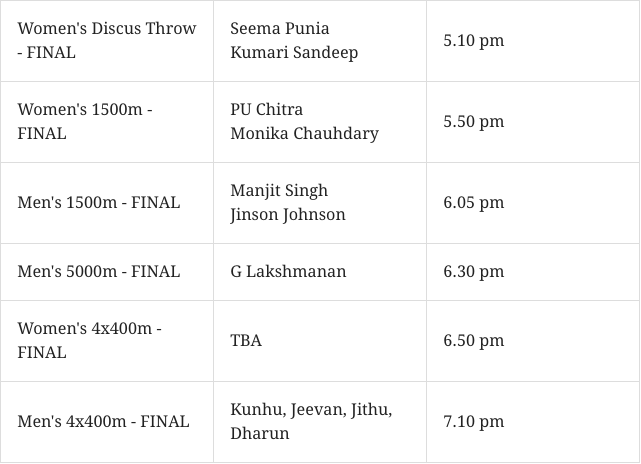 Women’s Discus Throw Final first up and India have a familiar name in contention for a medal. 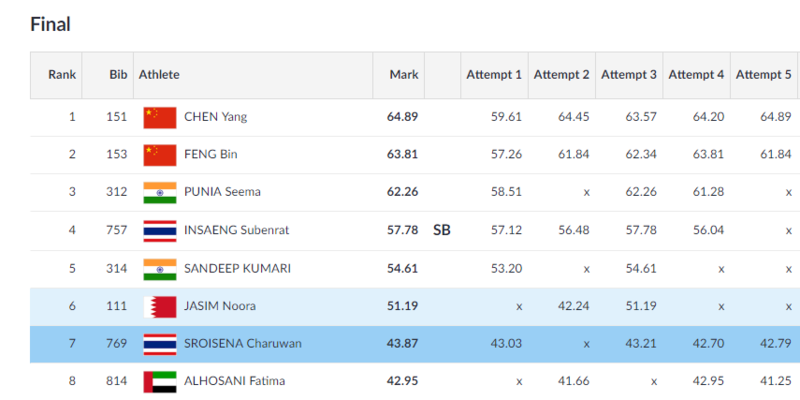 Seema Punia has the 4th best throw among in Asia this season (among those participating in the final tonight). Seema Punia and Sandeep Kumari have finished their first throws. 58.51m and 53.20m respectively. Alright, Jaideep Vaidya takes his leave and it’s Vinayakk Mohanarangan here to keep you company for the rest of the evening. The hockey game has taken a fairly dramatic turn in the third quarter – India took the lead, Malaysia equalise and India have taken the lead again! Chinese trampolinist Dong Dong, 29, became the first Asian Games athlete to win an individual event three times in a row, reported AFP. The London Olympics champion scored 59.925 to win the gold in the men’s final ahead of his compatriot Gao Lei and Kazakhstan’s Pirmammad Aliyev. The 29-year-old has won three Olympic medals as well. The score is still 0-0 at half-time in the men’s semi-final between India and Malaysia. This has been an even contest so far by both teams. Follow the match in our hockey live blog here. 4.50 pm: A fist-sized hole in the wall, an illegal kick in the back, a cry of biased judging – as debuts go, martial art pencak silat’s first Asian Games appearance was a little rocky. Read more here. At the end of the first quarter, India and Malaysia are tied 0-0. Malaysia did score a goal but it was later disallowed after India went for a video referral. You can catch all the updates in our hockey live blog here. The Indian men’s team’s semi-final match against Malaysia has begun. Malaysia are the second highest-ranked team in the competition after India. You can catch all the updates in our hockey live blog here. 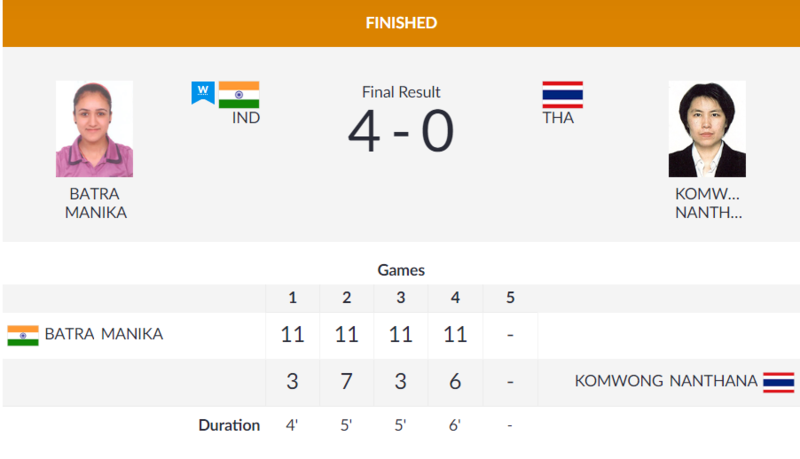 Thailand beat India 2-0 in their Women’s Quadrant group match. India have lost all four of their group matches and will not progress to the semi-finals. 3.43 pm: The Indian men’s hockey team’s semi-final match agains Malaysia will begin at 4 pm IST. Did you know that India hockey captain PR Sreejesh wrote separate letters to all the 17 players and coaching staff ahead of the Asian Games? Meghna Kapoor has more here. 3.33 pm: Dutee Chand is maturing as a runner and will only get better with more competitions, says Rachita Mistry, the last Indian to win a 100 metres medal at the Asian Games before Dutee. Read here. 3.13 pm: This is nothing to do with the Asian Games but it’s YUUUUGE – so here goes: Virat Kohli has named an unchanged playing XI in a Test match. Yup. You can follow the cricket in our live blog here. 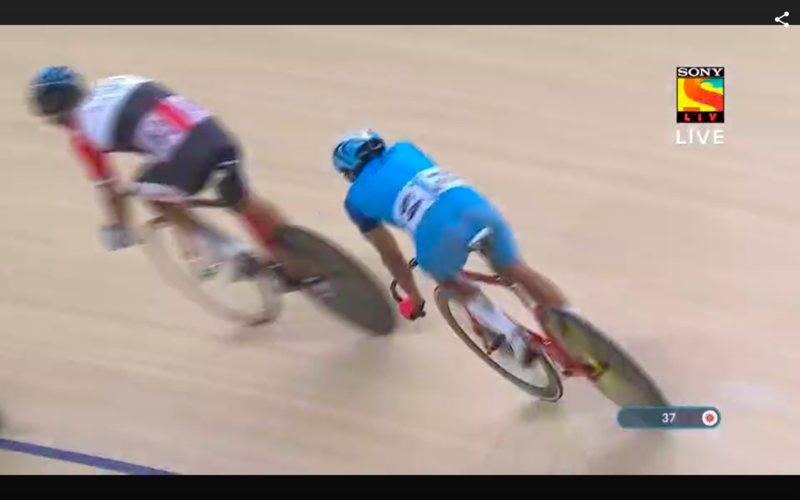 India’s Manjeet Singh is unfortunately the first cyclist to be eliminated in the men’s omnium elimination race. Sharath Kamal’s opponent in the round of 16 is Chinese Taipei’s Chih-yuan Chuang – the world No 14. The two faced each other in the team event and Sharath lost in four games (11-1 11-8 10-12 11-1). A chance to reverse that, then. It’s time for the elimination race of the men’s omnium, with India’s Manjeet Singh in the fray. In the elimination race, the cyclists complete a rolling start. On every second lap, the last cyclist to cross the finish line is eliminated from the race. The last remaining cyclist is the winner of the race. Danish Kumar goes down in the quarter-finals, losing 0-10 to Kuwait’s Husein Misri in the men’s -90 kg category. Easy does it. No alarms here as Sharath cruises into the Round of 16. The match was done and dusted in 18 minutes. More like a practice game for him. Time for Achanta Sharath Kamal’s Round of 32 match in the Men’s Singles competition against Pakistan’s 52-year-old Muhammad Qureshi. The Indian women’s team loses their pool match to Hong Kong 1-2. 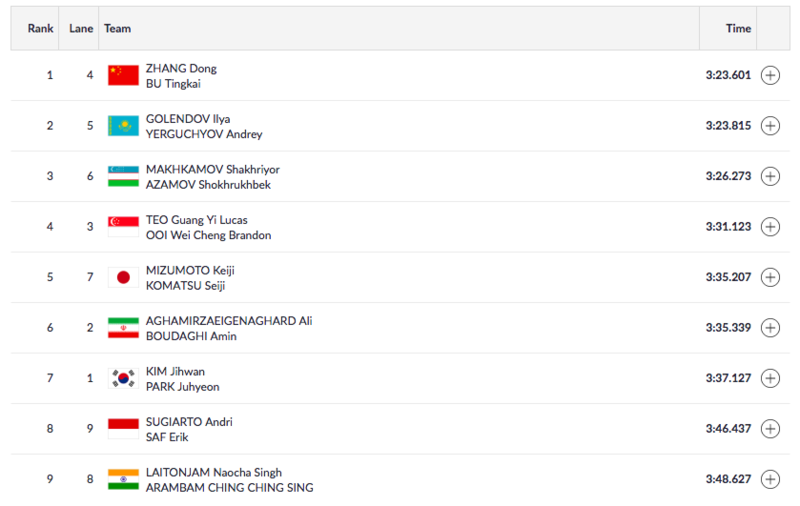 India’s Divesh goes down to 0-10 to Kazakhstan’s Yakhyo Imamov in the Men’s -90 kg Round of 16. 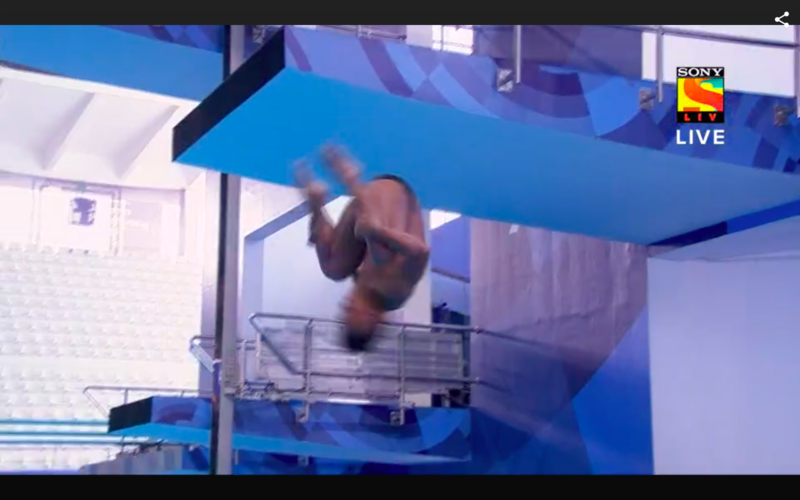 Ramananda Sharma has a really good final dive in the men’s 1m springboard preliminary round, going for the Forward 2½ Somersaults 1 Twist in Pike position, which has a high difficulty level of 3.2. He is given a score of 62.40, taking his total to 327.40. His final position is seventh heading into tomorrow’s final. Ramananda Sharma goes for a tough fifth dive – the Forward 3½ Somersaults in Pike position – which has a difficulty level of 3.3. And he does extremely well, scoring 66! His total goes to 265. However, his position remains the same – 8th. India’s Danish Sharma is into the quarter-finals after defeating Palestine’s Mohanad Abueida 10-0 in the men’s -90 kg category. A much better fourth dive by Ramananda Sharma – in fact his best so far – as he goes for Inward 2½ Somersaults in Tuck position. He is scored 62 for this dive, taking his total to 199 and position back to eighth. 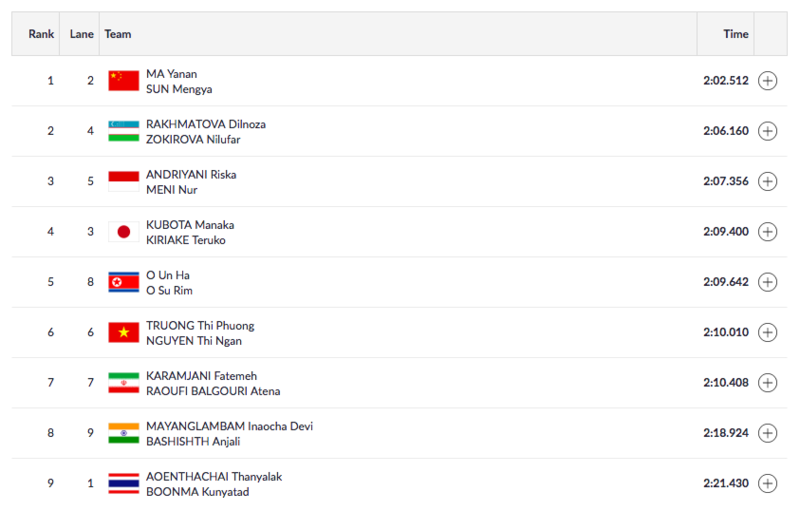 Amisha Tokas takes on Vietnam’s Thi Lan Nguyen in the women’s -78kg Round of 16, but the 17-year-old goes down 0-5 to Asian Championships bronze medallist. Ramananda Sharma has a poor third dive – the Reverse 2½ Somersaults in Tuck position – and is rightly given a score of only 37.50 by the judges, taking his total to 137. He slips back to 10th position in the table. Ramananda Sharma has a better second dive, in which he does Back 2½ Somersaults in tuck position. He gets a score of 54 for this dive, taking his total to 99.50. He is currently in eighth position. Jyoti Tokas loses her round of 16 match in the women’s -78 kg to Turkmenistan’s Mariya Lohova by a 0-10 scoreline. 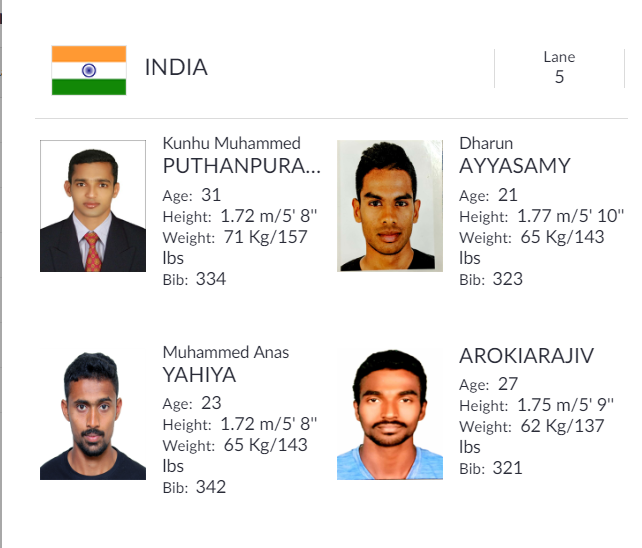 It's the final day of action at the track & field for India at the Asian Games. India’s Ramananda Sharma goes for forward 2½ somersaults in pike position in his first 1m Springboard dive, and is given a score of 45.50. He currently lies in 10th position. India’s Danish Sharma beats Indonesia’s Muhammad Dhifa Alfais 3-0 in their men’s 90kg round of 32 match. India’s 15-year-old Jyoti Tokas wins her round of 32 match in the women’s -78kg category against Thailand’s Meesri Prawanwit 1-0. A Unified Korea women’s basketball team has beaten Chinese Taipei 89-66 to reach the final. Cheered on by around 100 fans waving Korean unification flags, North Korean Ro Suk Yong joint top-scored with 17 points in a blow-out victory in Jakarta, reported AFP. The winners await either China or Japan in this weekend’s gold medal game. Indonesian race-walker Hendro has lashed out at the pollution in the country after collapsing during the men’s 50km walk, saying it was a “miracle” to even finish it. Hendro was carried from the finish line on a stretcher after collapsing, reported AFP. The 28-year-old had pounded Jakarta’s smoggy streets for more than four-and-a-half hours to finish last. His timing was the slowest in the 50km walk at the Asiad for nearly three decades, the report said. The air quality index in central Jakarta hit 163 on Thursday morning, the report added. A reading of more than 150 is considered a health threat. Mouma Das is knocked out of the women’s singles by world No 26 Chen Szuyu, who wins the round of 32 match in straight games. Mouma Das loses the third game to Chen Szuyu 6-11. The Taiwanese needs to win just one more game to move into the next round. It looks like Mouma Das is no match for Chen Szuyu as the Indian loses the second game easily as well, 5-11. Mouma Das loses the first game to Chen Szuyu 6-11 in their round of 32 match. Here’s Abhijeet Kulkarni on what PV Sindhu needs to do to cross the final frontier and win a big tournament. 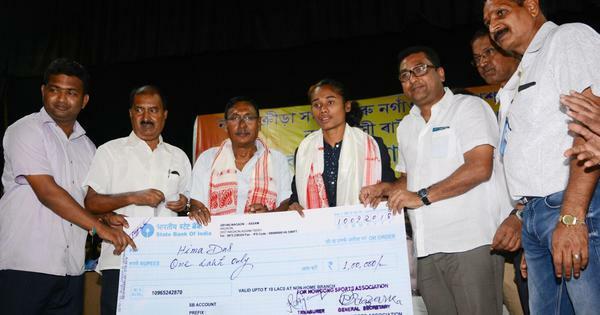 A toothache and six toes on each foot couldn’t stop Swapna Barman from becoming Asia’s best athlete. 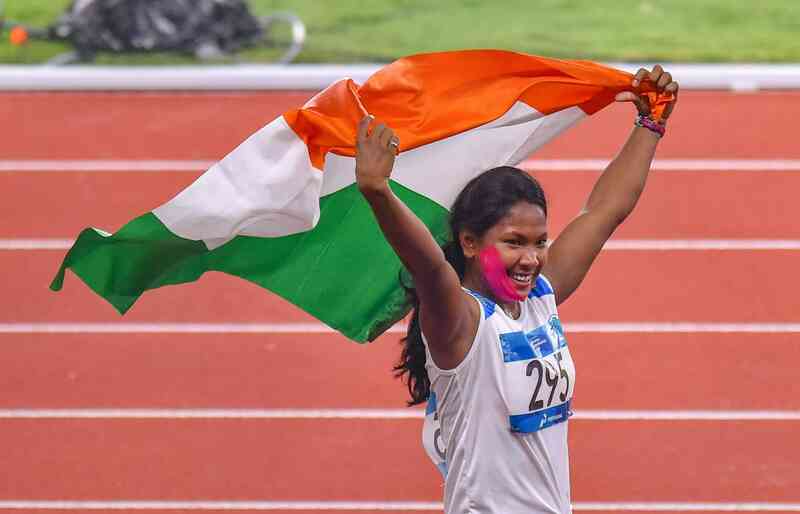 Read Arka Bhattacharya’s piece on the women’s heptathlon winner here. Manjeet Singh finishes 16th out of 18 cyclists in the tempo race of the men’s omnium event. Overall, he is in 17th position with 20 points. Next up in the omnium is the elimination race, which will begin at 2.36 pm. The tempo race of the men’s omnium event has started, with India’s Manjeet Singh in the fray. In the tempo race, which is run over 10 km, there is a sprint on every lap after the first four laps, with the first rider crossing the line winning one point. Any rider who gains a lap on the field is awarded 20 points, while any rider that loses a lap has 20 points deducted. Read more here. India’s Gaurav Tomar and Sunil Singh Salam finish sixth out of nine sailers in the men’s Canoe Double (C2) 1,000m final with a time of 3:56.477. Uzbekistan, who won bronze, had a timing of 3:44.061. 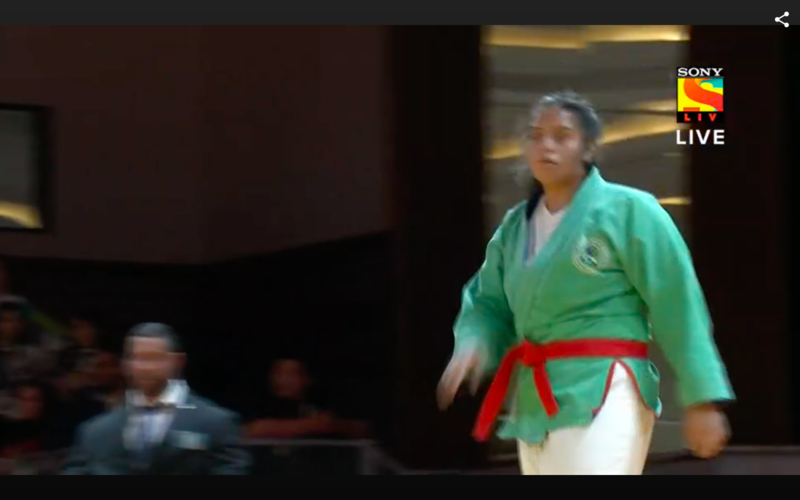 India’s Garima Choudhary loses her women’s -70 kg elimination round of 16 match to Uzbekistan’s Gulnoza Matniyazova after the latter scored an ippon point, which ended the bout. India’s Aleena Reji and Deborah Herold are knocked out in the round of 16 of the women’s sprint. Aleena lost to the legendary Sze Wai Lee of Hong Kong, while Deborah was beaten by Sze Wai’s compatriot Hoi Yan Jessica Lee. India’s Harshdeep Singh Brar loses his men’s -81 kg elimination round of 16 match against Korea’s Lee Seungsu after receiving three shido penalties for minor violations. The Korean was awarded one ippon, or a full point. Once an ippon is scored, the match ends. 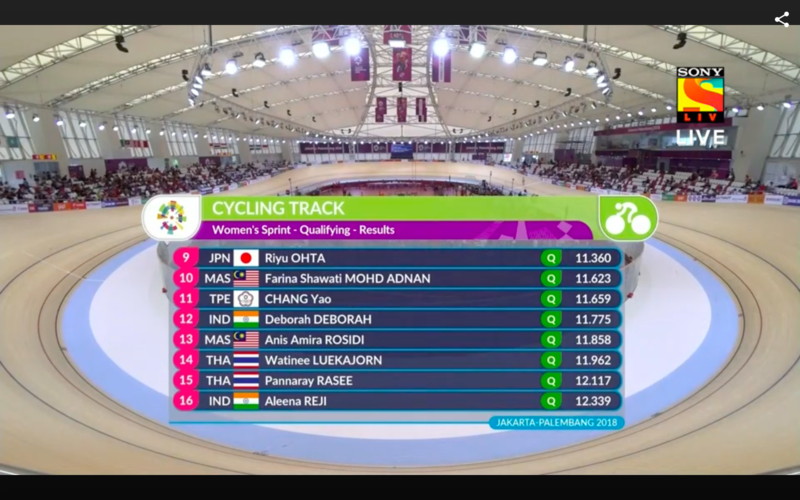 As expected, India’s Chaoma Devi fails to qualify for the women’s 3,000m individual pursuit medal rounds after finishing last in the qualification round. India’s kayakers continue to come in last in their final races. This time, Naocha Singh and Ching Ching Sing Arambam finish at the bottom in the men’s Kayak Double (K2) 1,000m race. 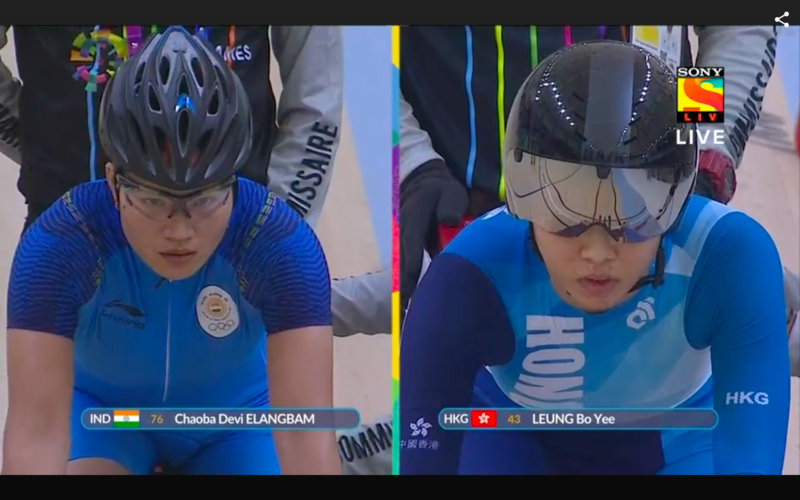 Chaoba Devi records a timing of 4:05.298 in her women’s 3,000m individual pursuit qualifying heat, which is much slower than her competitor, who got 3:47.570. Chaoba Devi is all but certain to not qualify for the medal round. It’s time for the women’s 3,000m individual pursuit, with India’s Chaoba Devi Elangbam in the fray. In qualifying, each rider covers the distance alone and is timed. The best finishers are then seeded and take part in a knock-out for the medals, starting on opposite sides of the track. India’s Deborah finishes 12th, while Aleena Reji records the worst time in the women’s sprint qualification round. This means that in the round of 16 Aleena will have to take on Hong Kong’s Sze Wai Lee, who topped the round with an Asian Games record timing of 10.583 seconds. 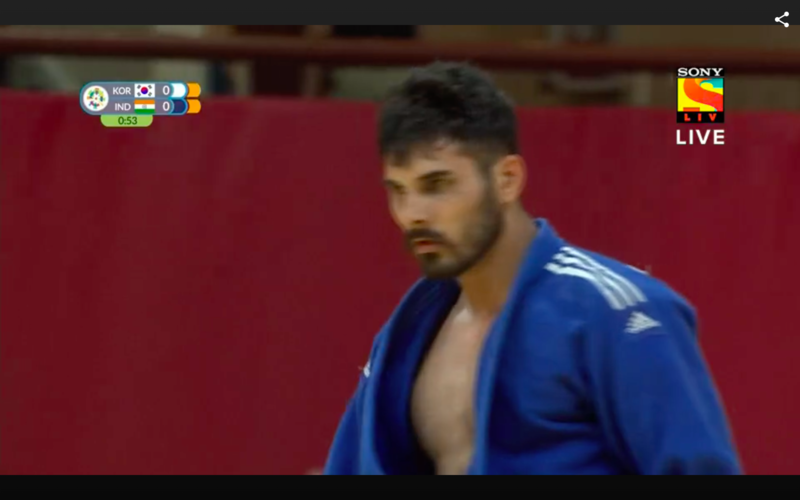 India’s Harshdeep Singh Brar wins his men’s -81kg elimination round of 32 bout against Sri Lanka’s Rajitha Pushpa Kumara after scoring an ippon, or one full point. Once an ippon is obtained, the competition ends. 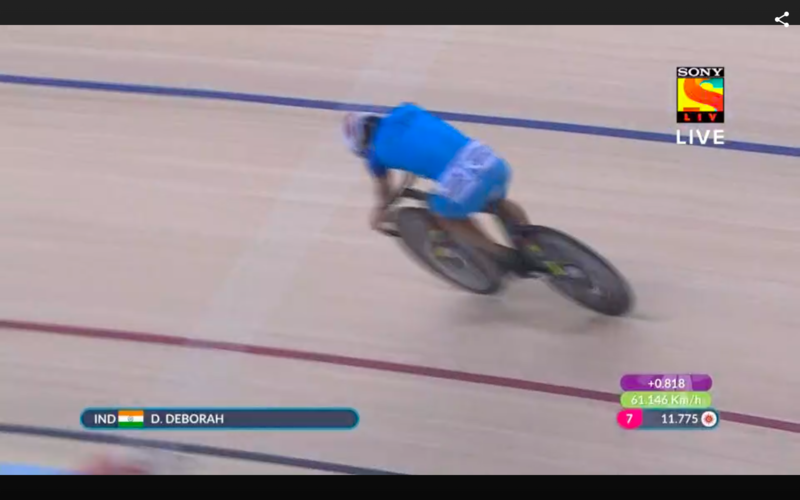 Deborah Herold records 11.775 seconds in the women’s sprint qualification round, while Aleena Reji has 12.339s. All riders are not finished yet so we’ll have to wait to find out their final positions. 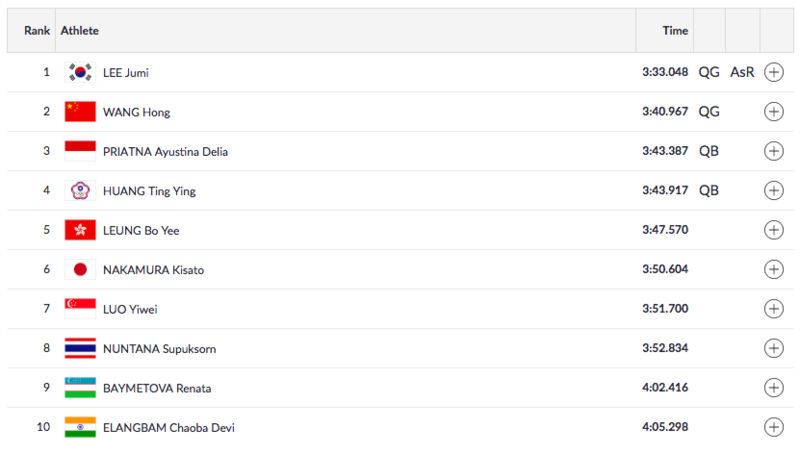 Next up is the women’s sprint qualification round, where India’s Deborah and Aleena Reji will try to set the best possible times among 16 riders to ensure they don’t face a tough opponent in the knockout rounds. In the round of 16, the fastest rider from qualification will take on the slowest, the second fastest will take on the second slowest, and so on. 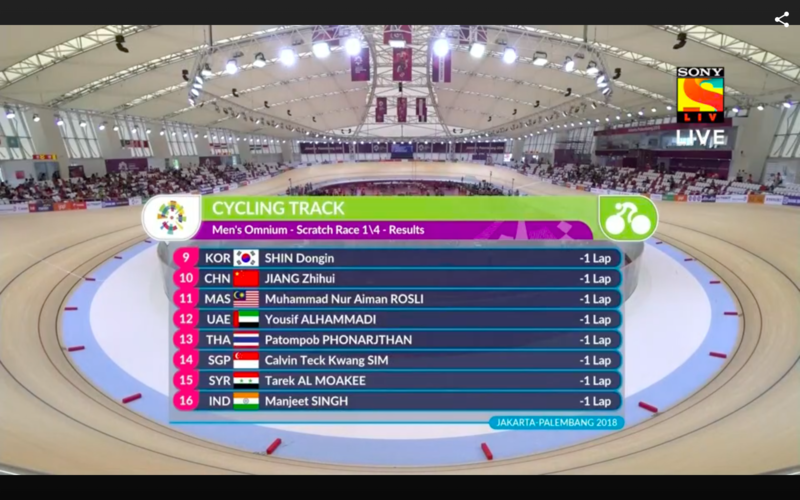 India’s Manjeet Singh finishes 16th in the scratch race of the men’s omnium, which gets him 10 points. The next event in the omnium is the tempo race, which will start at 9.35 am. The scratch race of the men’s omnium has begun, with India’s Manjeet Singh in the fray. There are 40 laps which cover a distance of 15km. The first across the finish line wins. The Indian team finishes ninth and last in the men’s Kayak Four (K4) 500m A-final. In the women’s Kayak Single (K1) 500m, Soniya Devi Phairembam also finishes last. Disappointing start for India in canoe/kayak. Some bad news coming from the men’s 50km racewalk, where India’s Sandeep Kumar has been disqualified after the halfway mark. He was disqualified after receiving three red cards for losing contact with the ground, which is not allowed in race-walking. In the first final of the day for India, Inaocha Devi and Anjali Bashishth finish 9th in the A-final of the women’s Canoe Double (C2) 500m. Good morning and welcome to The Field’s live blog for day 12 of the 2018 Asian Games in Jakarta and Palembang. India have won 54 medals so far and could add at least 11 more on Thursday, which is the final day of athletics. The 4x400m relay teams and Seema Punia (Discus Throw) are some of the medal hopefuls as India look to go past the tally of 57 medals from 2014. The table tennis singles action starts on Thursday with Mouma Das, Sathiyan Gnanasekaran, Manika Batra and Sharath Kamal all in action. Indians will also be contesting finals in canoe and kayaking.